Less than two months shy of her 100th birthday, Odessa Louise Edwards Delpesche died peacefully at her Petit Bordel home October 14, surrounded by family and loved ones. Odessa was born at Rose Bank on 1 December, 1913 to James and Margaret Edwards; she had 14 siblings, two of whom are still alive. Rita, 96, told SEARCHLIGHT that she is saddened by her sisterâs passing, but death should be expected. âWe grew up poor, but we had pride and work hardâ, Rita said. Longevity runs in the family, as Odessaâs mother lived to 105, while her older sister Beatrice Smith, who lived in Kingstown, lived to 103; another older sister Amanda, who was born on Christmas Day 1908, died in 2010; younger brother Daman, in his 90s, lives in Rose Bank, is still active, occasionally playing steel pan with the Rose Bank Folk Band at funerals and other occasions. Odessa lived an active life and regularly attended church until a few months ago. But before that, she went for walks and motivated the others. Granddaughter Marvlyn said that in her grandmotherâs youth she sold fish in Georgetown, walking over La Soufriere mountain to get there and back. Marvlyn recalls that her grandmother always told the story that after having sold fish on one occasion, she bought two wooden chairs in Georgetown and had to send her daughter and a young man to Georgetown to get them. âShe always says that children are not the same these days,â Marvlyn said. 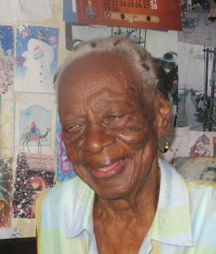 Two months ago, Odessa took ill with shortness of breath and was hospitalized at the Milton Cato Memorial Hospital (MCMH) in Kingstown, but had been home for close to a month when she died. Odessa is survived by five of her seven children, numerous grand, great, great grand and seven great, great, great grandchildren.